Hello everyone! It's been 2 months that my blog is in hiatus. Originally I was planning to just take a rest for a month but it got extended because of my laziness and the fact that my hands are always full nowadays. It's not easy working from home since I also need to do a lot of household chores (laundry, cleaning our room, feeding the dogs, etc). I end up getting tired even on weekends, making me wish that I have a vacation every two months. So how you've been? Hope you will all stick by me regardless of my long absence. The past years I've been wanting to have a blog makeover since it's getting a little boring don't you think? The other blogs I've seen have these cheerful colors and they have social media buttons which obviously my blog is lacking. 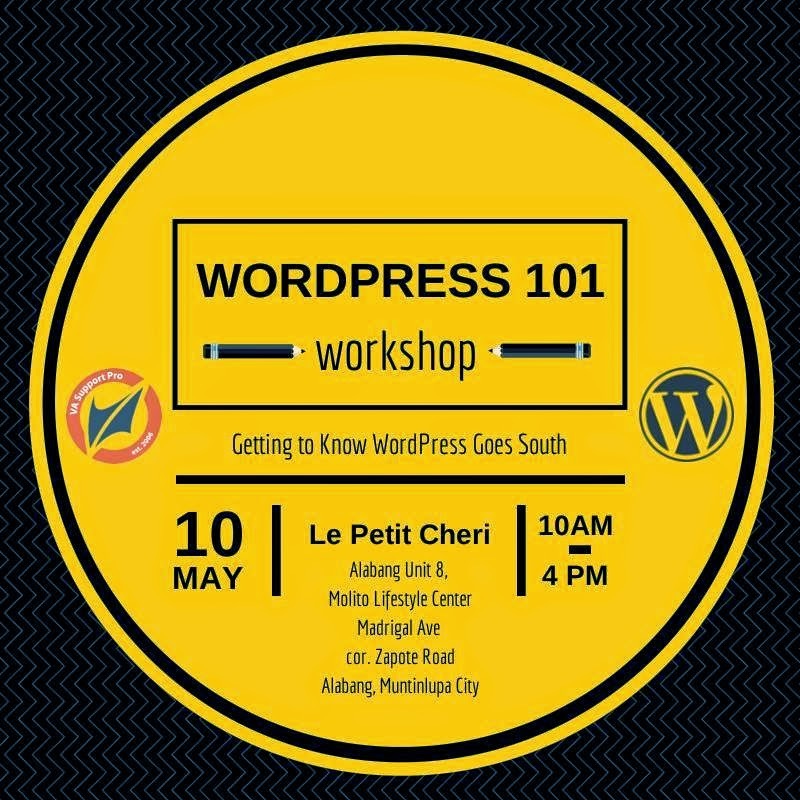 So before plunging deeper to that plan, I decided to sign-up for a workshop which will happen next Saturday and it's all about Getting to Know WordPress by The Happy WAHM. My blog is in Blogger platform since 2008 and I'm in limbo if I need to change my blog to Wordpress platform since they offer a lot of blog templates to choose from. In addition, I'm still a newbie when it comes to the technicalities surrounding Wordpress. What to expect in this workshop. Everyone will be given a hands-on experience to work on a self-hosted WordPress dashboard. Well, yeah, we can also create a free site with WordPress.com, but we want you to experience all the fun part of a self-hosted site, and fun has a name. It's called a plugin. So you ask, what is a self-hosted site? And what is a plugin? Those, and a lot more of your questions will be answered at the workshop. After all, this is one full day of us being kids, asking all the whys and the what-ifs of WordPress.